Cheesecake is a dessert that everyone in my family loves. I turn to it for our annual gatherings more than any other sweet, and it never disappoints. 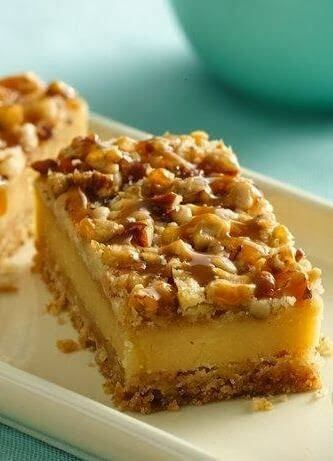 This decadent cheesecake bar from Bettycrocker combines the irresistible flavors of cheesecake, a nutty crust, caramel and a praline-like topping make this dessert extra special. Cutting into bars makes them easier to serve to a crowd than cake. Heat oven to 350°F. Spray bottom and sides of 13x9-inch pan with cooking spray. Place cookie mix in bowl; cut in butter using pastry blender or fork until mixture is crumbly. Reserve 1 1/2 cups mixture for topping. Press remaining mixture in bottom of pan. Bake 10 minutes. 2Meanwhile, in large bowl, beat cream cheese, sugar, flour, 1/4 cup of the caramel topping, vanilla and egg with electric mixer on medium speed until smooth. 3Spread cream cheese mixture evenly over partially baked cookie base. Sprinkle with reserved crumb topping, pecans and toffee bits. 4Bake 35 to 40 minutes or until light golden brown. Cool 30 minutes. Refrigerate about 2 hours or until chilled. Drizzle with remaining 1/4 cup caramel topping. For bars, cut into 9 rows by 4 rows. Store covered in refrigerator.